We can define Navaratari meaning Nine Night Dance festival. 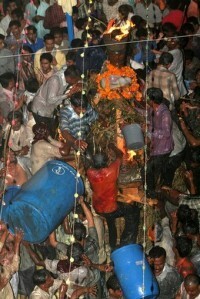 It is celebrated all over India. Gujarat, Maharashtra and West Bengal are states were Navratri celebrated maximum. Rupal, a small village around 47 km away from Ahmedabad and 12 km from my city Gandhinagar. Rupal is known for Ma Vardayini Temple and Palli of Ma Vardayini. There is one big Temple with new look, all the basic facilities on the main road. Palli is a wooden frame of around 6-7 feet height. . It is made by some Prajapatis in the village, then Rajput made some tilak from his ancient sword and then the Palli starts moving all over the village on some predefined route. Its having holy fire kindled at top of it and also on all four corners. Pure Ghee or clarified butter is being poured onto a Palli.. During the route at each and every place people are ready with Ghee in pips and buckets, when the palli pass through, they pour it on the palli. More than 600,000 Kg of Pure Ghee poured onto a Palli. The price for that ghee is around 100 million rupees. Pure Ghee or clarified butter is been kept at around 27 different spots from all over village. These spots are call Chakalu or cross road. Pure Ghee was kept in Trailors and Big size of Bucket. 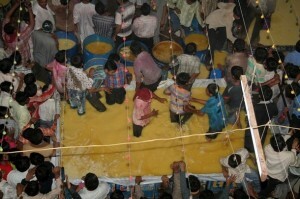 View following picture where devotees and volunteers walk in a vat of ghee before it is poured onto a Palli. Bellow picture is of Palli. Volunteers are standing on it and taking kids on top of holy fire kindled at top. Kids are being blessed by this way. Once kids at that spots are done with blessing process it comes to poured ghee onto Palli. Volunteers use buckets to poured ghee. All volunteers get wet with ghee and its ghee all around. There are lacs of people to watch the same. It was really amazing experience. I, myself had walked in Ghee where level of the Ghee on the road is about 5-6 Inches. And the mystery is that there is no stain of ghee is left on your clothes. Gujarat ST buses ply from Gandhinagar Bus Stand at every 15 mins to Rupal on 8th night of Navratri to be the witness of the occasion.